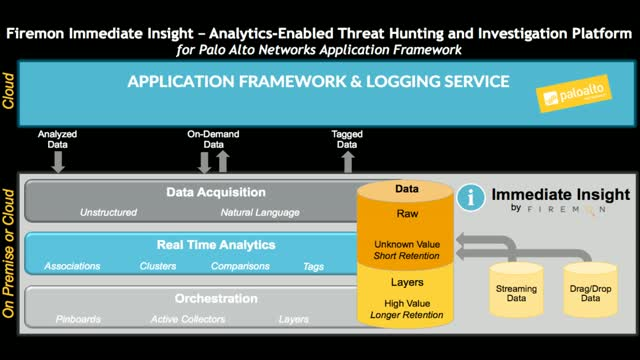 Optimized for the Palo Alto Networks Application Framework, Immediate Insight is an analytics-enabled app that enables security teams to seamlessly combine and analyze cloud-resident and private infrastructure data to accelerate discovery and response to security threats. Today's security teams struggle with the challenges created by continuously evolving networks and threats. We'll demonstrate how using McAfee® ePolicy Orchestrator® (McAfee ePO™) software and Lumeta Spectre together gives IT organizations the real-time visibility they need to proactively identify, manage, and respond to endpoint security issues and threats across dynamic cloud, virtual, mobile, and physical networks. "Enterprises today are leveraging multiple clouds and thousands of applications. What are the security and compliance risks associated with a multi-cloud strategy? - Recommendations for improving enterprise cloud security"
You need to understand all the potential pathways malicious traffic could possibly take through your network – including obscure and indirect paths that don’t immediately look risky or valuable to an attacker. Moreover, you need to be able to juxtapose that network topology and path analysis with your host level security vulnerabilities. Join us to explore all of these steps and then how to juxtapose and overlay all of this information into a comprehensive, multi-dimensional attack surface. FireMon is the perfect sponsor for this event and Scott Custer will show you how their unique technology, Lumeta, provides real-time visibility, vulnerability indicators, and risk identification enabling cloud, network, and security teams to find and secure unknown, rogue and shadow IT, network infrastructure, and endpoints. Many enterprises are adopting a cloud-first strategy in efforts to drive business innovation and growth. As cloud deployments grow, security requirements grow with them – leading to a trend of security responsibilities becoming dispersed as traditional security implementations impede the speed to delivery. Distributed responsibilities lead to fragmented security implementations - add to the problem the lack of skilled personnel, misconfiguration errors, overly permissive access, shadowed IT, and a lack of consistency between on-premise and cloud security controls, and you can end up with a recipe for disaster. Utilities need scalable solutions to help them adapt and comply with the constantly changing NERC CIP requirements. FireMon can partner with utilities to automate their security policy workflows, optimize their vulnerability management efforts, and get their networks under control with complete visibility, real-time monitoring and continuous compliance checks. Running workloads in the cloud makes provisioning and setup easier—just spin up a VM. But you might be surprised by how many firewalls you’ll end up with in the cloud if you follow best practices. Cloud providers are clear on this point. Amazon says, “Security and Compliance is a shared responsibility between AWS and the customer… The customer assumes responsibility and management of the guest operating system (including updates and security patches), other associated application software as well as the configuration of the AWS provided security group firewall.” In short, cloud security is in your court. We will help you understand how networking security works within the Amazon cloud and with connections to the outside world. We will also discuss the need to keep all this straight, understood, consistent and configure to reflect your security intent accurately. The cloud is a notable business advantage, but it does bring numerous security concerns including: a lack of visibility across cloud or between on-premises and cloud environments, monitoring security controls and changes within cloud and multi-cloud environments, and maintaining compliance by monitoring cloud traffic for suspicious and non-compliant behavior. It becomes increasingly complex in hybrid environments because now you're managing security for on-premise, cloud, virtual, container environments, and more. The time commitment can feel staggering. It doesn't have to, however. Cybercriminals target the data-rich healthcare industry disproportionately. Healthcare IT organizations, already burdened with budget constraints and the scarcity of technically proficient staff, must also contend with significant blind spots within their own networks. These blind spots occur everywhere, from endpoints into the cloud, and every blind spot increases the opportunity for attacks such as ransomware to be successful. Eliminating those blind spots requires healthcare organizations to identify all of their wired, wireless, mobile and medical devices in real-time. With comprehensive context available, organizations can help prevent breaches before, during and after an attack. Lumeta has been deployed at some of the largest enterprises and government agencies based on our ability to eliminate 100% of your IP network and connected device visibility gaps, improve your overall security posture, and reduce the risk of patient data theft. Adopting a Zero Trust model means taking the first steps to redesigning your network in order to strengthen data security, detection, and response. In such an ecosystem, it can no longer be about just writing security rules. Instead, enterprises must adopt a method of security intent and separate that desired goal of security from the specific implementation. This hierarchy allows you to set a single global policy that’s applied to any network resource with all its defining attributes – regardless of mutations in the network. At the same time, you can reduce the number of access requests that need to be managed manually and automatically ensure real-time compliance. And even more, business intent can be fully in line with security policy controlled at speed and scale. At most hybrid enterprises right now, these aren't realities -- but they can be, and that's where network security is headed. Join our guest, Forrester's Chase Cunningham, with FireMon's Vice President, Product Strategy at FireMon, Matt Dean for a look at the future of network security, which will ultimately enable each business team to fully own their security policies. It becomes increasingly complex in hybrid environments because now you’re managing security for on-premise, cloud, virtual, container environments, and more. The time commitment can feel staggering. 3. Automation and orchestration: Ingest behavior details from your cloud, then command security controls to cloud systems from a single console. The idea is instant, worry-reducing cloud control. Network virtual appliances from well-known Next-Gen Firewall vendors offered in cloud marketplaces. This lets you quickly spin-up a traditional NGFW product on a pre-configured VM and you can potentially use the same firewall vendor in the cloud and on-prem. Is cloud network security just a matter of more firewalls or are there nuances specific to cloud workloads? When should you implement multiple tiers to security cloud workloads? When are built-in security features (like Azure Network Security Groups) enough and when do you need more? We will also discuss the need to keep all this straight, understood, consistent and the configuration accurately reflecting your security intent. Managing all your on-prem firewalls is challenging enough, let alone the cloud. In this webinar replay, we'll discuss 4 key principles your organization needs to be successful with the EU's demand for tighter data protection, along with the penalties for the violation. GDPR provides an example of how countless security professionals can be led to anxiety and dread with a looming stack of regulations on fast approach. Put the fears to rest. GDPR is a special instance of government regulations; you’ve seen this for decades. There is nothing to fear. Nothing. Firewall migration projects are filled with risk: cost overruns, misconfigurations, connectivity failures, and security risk. Every year, security teams review, test, and procure new technologies to keep data protected. So, there is no shortage of opportunity for migration headaches. In this webinar, we’ll show you how to avoid these traps. It’s time to make sure your migration is fast, simple, and secure. Join us and see how migrations do not have to bring disruptions, ballooned costs, or security risks. You can realize the benefits of leading-edge technologies, next-gen firewalls, and security devices with simple, repeatable essentials in your upcoming migration. FireMon delivers continuous security for hybrid enterprises through a powerful fusion of vulnerability management, continuous compliance and orchestration. Since creating the first-ever network security management solution, FireMon solutions have continued to deliver visibility into and control over complex network security infrastructure, policies and risk for more than 1,700 customers around the world.